Airtel, India’s largest telecom operator comes with a special Airtel Advantage plan for all of its Prepaid customers in all circles. Airtel introduces Night Calling pack to call any local Airtel number at Re1/20 minutes between 11pm to 6am. If Airtel is following Reliance’s footstep by introducing same offer to all circles, to become truly ‘Pan India’ Airtel has lot to go. Airtel’s plan costs are different in different circles and comparatively costly. Reliance’s night Own-net pack offers unlimited local calling within Reliance network at just Rs 33. 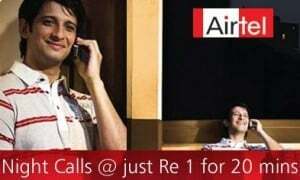 Airtel is still costly for love birds ! ; However RCom GSM network and indoor coverage are not good compare to Airtel. Please tell about night calling pack A2A 11pm to 6am and I want discount offer .